We always go back to Ornette Coleman. Always. 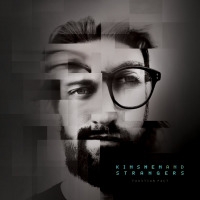 That might not be your first thought listening to Faustian Pact by Kinsmen And Strangers, but protracted contact with the trio's music summons the same tumult, or at least the same clamor felt in the early 1960s. Sure, the revolution's over, but the spirit and energy of those times is unmistakable. For adventurous listeners, that energy never gets old. Kinsmen And Strangers is the trio of saxophonist Jon Crompton, electric guitarist James Wengrow, and drummer Mike Alfieri. Their inaugural release bares its teeth with a vociferous thrust of aggressive music wrapped within some very taut compositions. "Turn up The Noise" spins an imaginary radio dial, shifting time signatures and moods throughout. Their kung-fu drunken master style is anything but impaired. You sense the trio is heading off the rails, but no, they've executed a perfect landing. Same for "FDJT /FDNC," which skitters under the halting pulse of Alfieri before it is twisted around (and around) Wengrow's guitar and Crompton's flash-fry saxophone. The saxophonist's sonic equivalent might be Chicago's Nick Mazzarella. With Wengrow and Mike Alfieri creating a phantasmal background, Crompton skates dreamlike figures on "Post-Then [Now]." The piece which lasts just six minutes, could easily have been drawn-out into 30-minutes of spellbinding sound. But then there's the terrifying attack of "Eureka, God Aliens!" which is part-Godzilla and part-E.T. (Note: both movie monsters were kind to children). Such is evidenced by the almost (I said "almost") chamber-like sounds of "Wagnerisch." The composition presents itself like a soundtrack to an Alfred Hitchcock film, where the pacific sounds foreshadow a coming storm. And what a storm these children, no grandchildren, of Coleman deliver. Track Listing: Faustian Pact; Gonzo Hero; Post-Then [Now]; Eureka, God Aliens! ; Wagnerisch; Turn up Your Noise; FDJT / FDNC. Personnel: Jon Crompton: alto saxophone; James Wengrow: guitar; Mike Alfieri: drums.